Very straightforward, but do leave a lot of time – this is really a 2-hour preparation. Heat 1 tablespoon olive oil in a heavy bottomed pan over medium heat. Add the crumbled sausage meat and stir and fry until lightly browned. If it sticks, great. Now add the onion, garlic, chiles and bay leaves and cook over medium heat for 30 minutes until onions are lightly browned, stirring frequently. You will be developing a fond and there will be stickiness – it’s all good. Pour in the wine and stir, scraping up the bits stuck to the bottom of the pan, until the wine has evaporated – about 2 minutes maximum. Add the drained crushed tomatoes, lower the heat, and cook at a steady but low simmer for 45-60 minutes until you have an intense dark red mess. Stir in the nutmeg, milk, and Romano pecorino. Season with salt to taste. Meanwhile, you have brought an extremely large pot of water to the boil. When you anticipate that you are approximately 10 minutes out on the sauce (the sauce can wait, so that part doesn’t matter), add several massive handfuls of kosher salt to the water, cover, and bring to a rolling boil again. Now add the pasta all at once, stir, cover, and set the timer to a minute or so less than the minimum time specified on the pasta box. Once at a rolling boil again, remove cover, stir the pasta, and keep stirring occasionally until timer goes off. About 1 minute before the timer goes off, add a half-ladle of starchy pasta water to the sauce, and stir it in – you want to evaporate it so that the sauce is not watery, but you also want a certain amount of pasta starchiness so that the sauce combines well. You might end up adding a half-ladle full of pasta water a second time, and evaporate that too. Play it by ear. 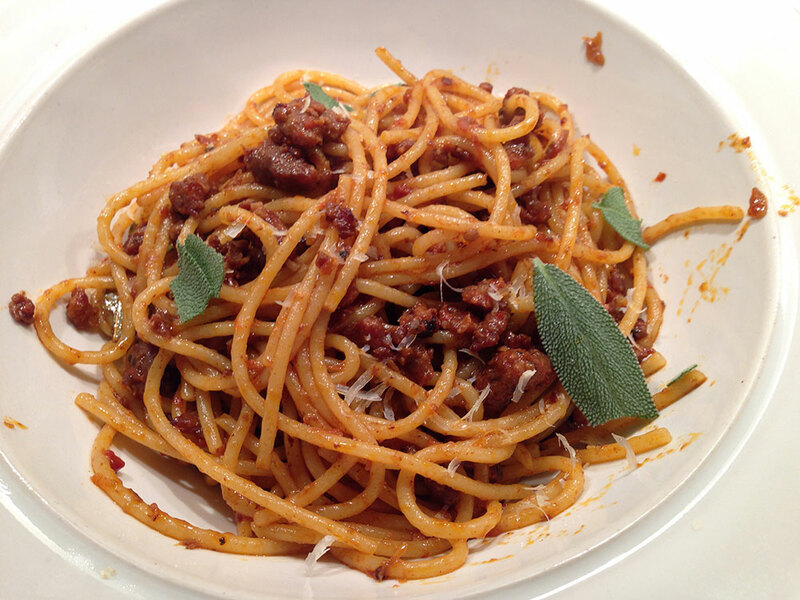 Taste the pasta – it should be not quite al dente but not quite inedible either. Drain it in a colander and add it to the sauce pan. Toss, drizzling some more olive oil over the mixture, and continue tossing until pasta and sauce are well combined.